Online shopping is extremely popular among consumers. The figures speak for themselves: global e-retail sales reached USD 1.9 trillion in 2016. With the growing number of retailers embracing online sales to grab a slice of this lucrative pie, the competition between ecommerce players intensifies. Consumers have become smart enough to search for offers on the Internet. Some customers take advantage of different savings search engines (e.g., Chippmunk) to narrow their search. When the customer finds an attractive offer and visits the store, chances that the purchase will take place are still not so high. Nearly 70% of users abandon their shopping carts, and unexpected shipping costs are often cited as the reason for that. To reduce their cart abandonment rates, web stores opt for free shipping. Some retailers regard this delivery option as a necessary evil, while it’s a smart marketing approach for others who aims at pushing shoppers to buy. 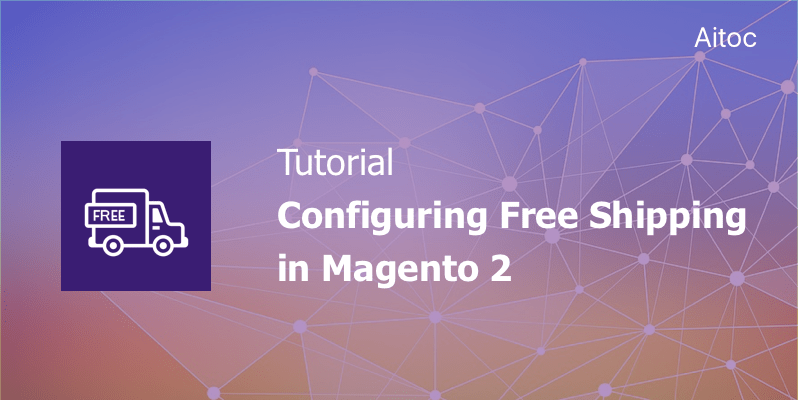 In this article, we are going to discuss how to configure free shipping in Magento 2. We’ll also give you a brief insight into the most common free shipping use cases. Retailers usually launch such offers during the holiday season when the competition grows exponentially or during a low season to entice shoppers to buy. It’s an all-year-round strategy that really works: customers buy extra items to spend a specified amount and enjoy free shipping without paying for the delivery. Such a promotion is useful for merchants who want to stimulate their clients to purchase certain products that are difficult to sell. This tactic is a perfect choice for e-stores striving to expand their customer base in some locations. Best customers join the VIP shipping program to benefit from the free delivery option. Merchants also offer coupon codes for the first purchase to encourage the purchase. Customers are given coupon codes in exchange for their email addresses. 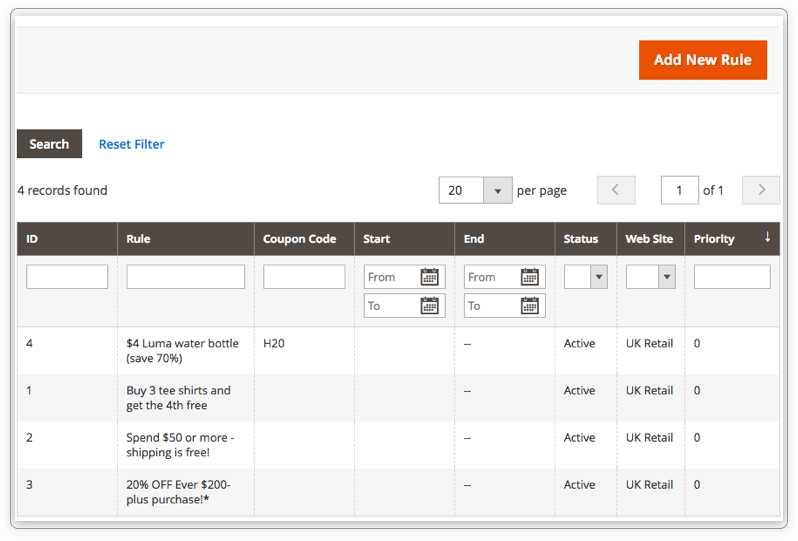 Magento stores often employ custom extension like Abandoned Carts Alerts Pro to remind shoppers about orders. They may include free shipping coupon codes in these emails to decrease shopping cart abandonment. 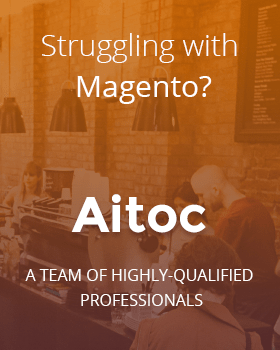 You must log in to your Magento store admin to enable this option for your customers. Once you are logged in, navigate to Stores > Configuration > Sales > Shipping Methods. Go to the Free Shipping section and enable the free shipping method. 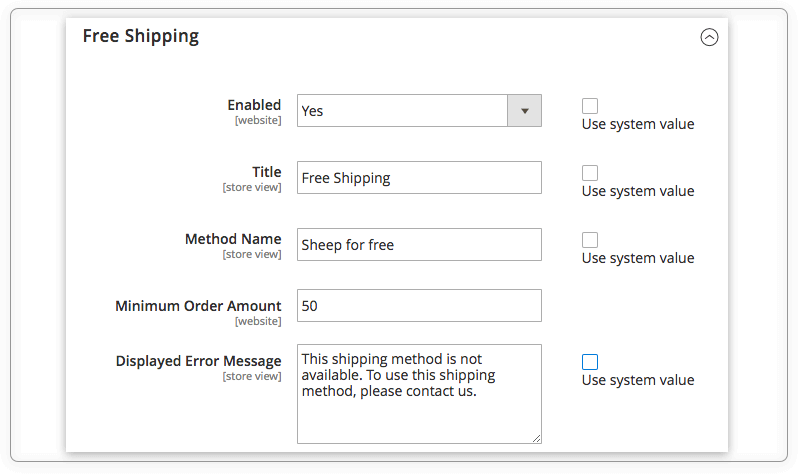 Select the ‘Yes’ option in the ‘Enabled’ field to activate free shipping in your Magento installation. You can assign a custom title that will be shown to your customers at the checkout stage. Set a method shipping name, too. Enter a minimum order amount in the corresponding field. If you don’t want to make the free shipping option available for everyone, our advice is to make the minimum amount high enough (e.g., 500) to prevent it from becoming effective. 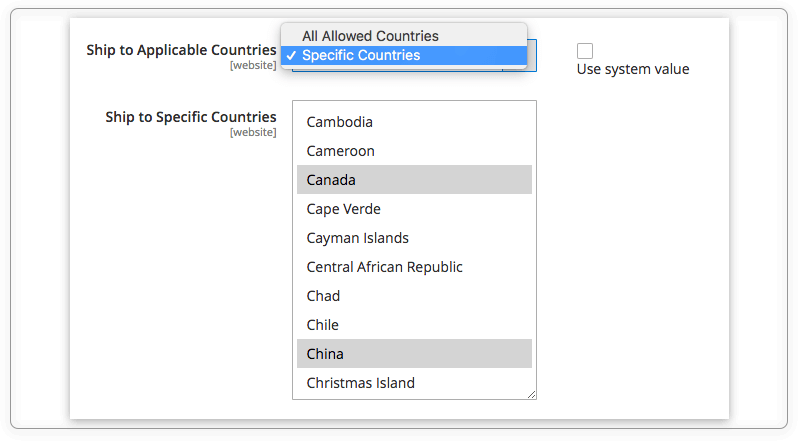 In the ‘Ship to Applicable Countries’ field, you can enable free shipping for all the countries used in your store configuration. One more option is to enable free shipping just for specific countries by utilizing the next box. Click the ‘Save Config’ button to activate this delivery method. Enable free shipping for the carrier that will make the delivery. Access the carrier configuration on the same page to do that. Don’t forget to save the config. 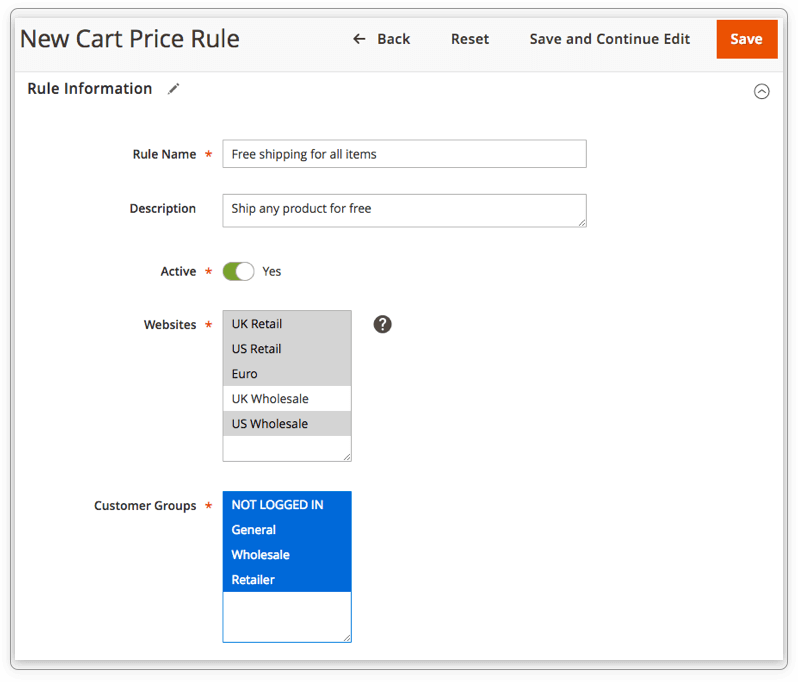 Magento stores can create different cart price rules for their free delivery campaigns. Navigate to Marketing > Promotion > Cart Price Rules and hit the ‘Add New Rule’ button. Now you can create a new rule. Enter a rule name, add a description and set ‘Active’ to ‘Yes’ to make the new rule work. Go to ‘Websites’ and ‘Customer Group’ boxes to enable the rule for particular websites and customer groups. To let shoppers use coupon codes, create coupons on the same page. 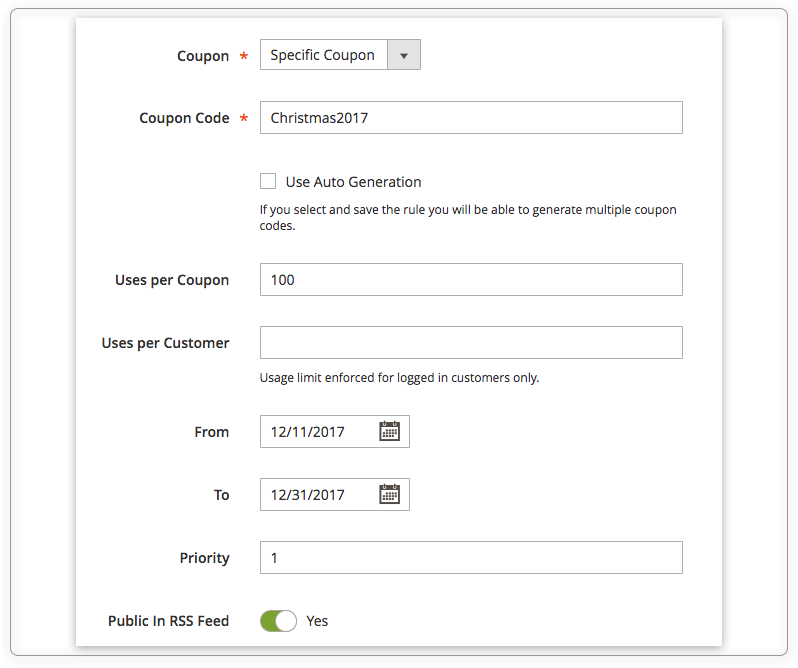 Here you’ll find a detailed tutorial on how to implement coupons in Magento. Online retailers often enable free shipping on all products during the holiday season. If you want to do the same, set the time limit on the Cart Price Rule page and proceed to the Actions section. 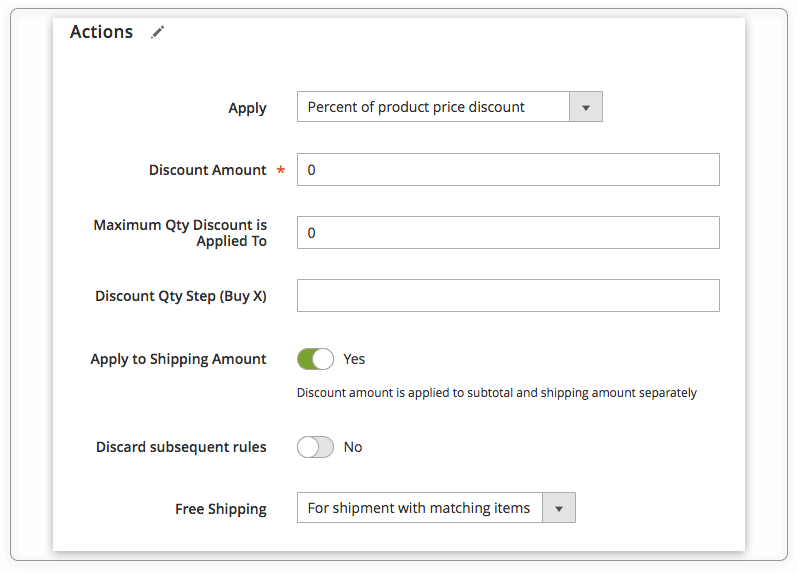 Select ‘Percent of product price discount’ in the ‘Apply’ field and then set ‘Apply to Shipping Amount’ to ‘Yes’. In the ‘Free Shipping’ field, choose ‘For shipment with matching items’. That’s it! Now you can click the ‘Save’ button at the top of the page and start your promotional campaign. Conditional free shipping is a common strategy among merchants. For instance, Disney offers free shipping on orders of USD 75 or more. Apply the described above Actions section’s settings and navigate to the Conditions section to set up the necessary condition. Here is how the condition for the ‘Spend USD 50 or more and get free shipping’ offer looks like. Online retailers do their best to stand out in the crowded ecommerce market, and the competitive pressure increases significantly during the holiday season. Free shipping is a common approach to dealing with the competition, as shoppers do love free delivery. Use our tutorial to enable different free shipment options for your Magento 2 customers, promote your offer effectively, and revenues won’t be long in coming.